Bake a six inch round cake. You will use star tip, size #18 to fill in and round tip, size #5 to do the outline work for the entire cake. With white and blue icing, fill in the eyes. With pink icing cover the rest of the cake making a second layer over the eyes to form the eyelids. 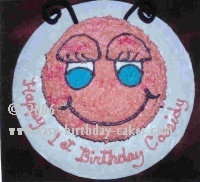 Use black icing and round tip and outline the eyes putting the eyelashes on. With pink icing, write the birthday message on the cake board. Finally, use black pipe cleaners and shape them for the antennas. Stick them in the cake near the top of the head.